Meet Tony Roma's Lamb Ribs Eating champs! The ultimate lamb ribs eating champions were crowned in a recent finale of the world’s first Tony Roma’s Lamb Ribs Eating Contest 2016, in a speed-eating face-off here. A large weekend crowd gathered in the concourse of KOMTAR JBCC to witness how eight male and eight female contestants flexed their gastronomic muscles to compete for bragging rights and the coveted prize of eating Free-of-Charge at Tony Roma’s for the next 12 months. To kick-off the event, ten contestants were invited from the audience to participate in a warm-up session of speed-eating a plate of French fries and drinking a tumbler of soda. Dangling the attractive prize of a portable electric oven, it was quite easy to interest passers-by, shoppers and by-standers to join in the game and enjoy a free snack. The audience cheered them on as a mixed group of male and female contestants sat down to race to finish a pile of French fries and wash it down with the fizzy drink. The winner of this challenge, Ramesh Nadeson, is no stranger to this competition as he was also the past year’s winner! The competition moved into the next (serious!) phase where female contestants took their seats to attempt the challenge to finish half a slab of Tony Roma’s famous lamb ribs and a portion of French fries. First-timer, Siti Farhana Azmi, 26, clocked 4 minutes 51 seconds to emerge the winner in this eating contest. Farhana, a junior secretary with a law firm in JB, who was tasting Tony Roma’s for the very first time, said her sister told her about the competition and urged her to take part. While most participants may have prepared their stomachs for the eating contest by starving themselves, Farhana came to the competition after having spaghetti for breakfast! When asked if she would join Tony Roma’s eating competition again, Farhana said she may do so if given the opportunity but humbly added that it was better to let others win. By this time the crowd in the concourse had swelled and shoppers, assailed by the tantalizing aroma of Tony Roma’s freshly barbecued lamb ribs, were also watching and cheering at all the action from the first and second level corridors. Then it was time for the male contestants to take the hot seats and deal with the serious challenge of eating a full slab of Tony Roma’s lamb ribs with a portion of French fries. The mood was highly charged with heated fun while supporters in the audience cheered the contestants on as they chewed their way through the competition. There must be a strategy to tucking into the juicy ribs and Muhd Reza Putra Salam, 35, must have hit on the solution because he polished his plate in 5 minutes and 28 seconds! Reza, a Singaporean technician who lives in JB, had just come off his night shift and arrived on time for the competition – tired and hungry – so he made light work of completing the challenge quite effortlessly! Also a first-time participant in the eating contest, Reza said he enjoys the taste of Tony Roma’s juicy beef and lamb ribs, and found that the lamb ribs tastes more tender. This was the fourth time Tony Roma’s held their Ribs-Eating Competition and the very first time competitors experienced the Lamb Ribs Eating challenge. Since Tony Roma’s opened in Malaysia a decade ago, this full-service, casual dining restaurant has garnered loyal fans for its juicy barbecued ribs, steak and seafood. With eight outlets in the Klang Valley, one each in Malacca and Kuching, Tony Roma’s celebrated its 10th anniversary recently by adding their newest outlet at Aeon Tebrau City to join the one in KOMTAR JBCC, with two outlets now opened in JB. While Tony Roma’s is a recognizable brand for its famous beef ribs, non-beef eaters were disappointed that they do not have the opportunity to taste these famous ribs. “At Tony Roma’s we always listen to our customers,” said Tony Roma’s brand general manager, Muhammd Adam Mah, who is also an experienced chef and restauranteur. Aware of the customers’ request for lamb ribs, he committed himself to creating a new item for the menu. Five years ago, when Adam created his ultimate, lip-smacking lamb ribs, he served it in a private food-tasting session, to Grand Companions (Tony Roma’s licensed franchisee) chief operating officer, Dickson Low, who happens to have an aversion to lamb. Adam knew that if Low – who does not like lamb – approved and accepted the taste of his barbecued lamb ribs, then they have certainly found the right recipe! This story will be told and retold again because after Low tasted the lamb ribs, he enjoyed it so much that he has since become a “lamb convert” for Tony Roma’s barbecued lamb ribs! These amazing lamb ribs have since been added into Tony Roma’s menu for non-beef eaters and lamb-lovers to enjoy. Now Tony Roma’s is not just a place for ribs as the menu also includes a selection of seafood, steaks, chicken, lamb, salad, sandwiches and burgers along with appetizers and mini desserts – all served suitable for Muslim consumption. Celebrate the festive season with Tony's Fiesta Lobster Platter at only RM199 for a limited season. The platter comprises 1 US lobster, 2 Bountiful Beef Ribs, 2 Filet Medallions, Grilled Salmon, a quarter barbecued chicken and 3 side items of your choice. Don't miss TR's refreshing mocktails served in Zesty Apple, Cranberry Fizz, Sweet Cherry and Miami Breeze. Two outlets of Tony Roma’s in JB are located at Lot 2013, Level 2 of KOMTAR JBCC, 80000 Johor Baru, Tel: 607 – 300 5060 and at G-112, Ground Floor, AEON Tebrau City, Taman Desa Tebrau, 81100 Johor Baru, Tel: 607 – 351 0749. Every now and then, I get emails from readers and in October, Elizabeth A. Louis wrote to tell me about Stagecraft, her company which is in the speaking skills business. Elizabeth, the director and principal trainer of Stagecraft, briefly explained their range of activities and one of the things they have been doing since 2014 is to get students between the ages of 7 and 17, to get interested in theatre. Her students are trained in public speaking skills through a series of lessons. She believes there’s no better way to show off their abilities than to present it in a live stage performance, usually at the end of each academic year. Elizabeth would encourage all the students to participate in various roles and let them perform live to an audience for an experience that will inevitably help them gain more confidence in public speaking. In past years, they have successfully staged popular children’s stories like The Gruffalo, Piglet – a parody of Shakespeare’s Hamlet, False Awakening – an original written by the students, a modern version of Cinderella and many more. This year, Stagecraft decided to focus on something different. They picked a few well-loved Malaysian folk tales or Cerita-cerita Rakyat Malaysia, as A Tapestry of Malaysian Stories that will be presented in black-box theatre. Elizabeth’s message certainly piqued my interest and what followed was an exchange of emails where she gave me more information about A Tapestry of Malaysian Stories, their annual drama cornucopia that was happening this November. While Stagecraft used their own premises for previous presentations, this year they decided to use a hall with a stage to present three ticketed shows over a weekend. A preview held a day ahead, was mainly for parents and guardians. When they were seeking a suitable venue, Elizabeth was delighted to discover the black box stage at Yayasan Warisan Johor in Jalan Mariamah, with a backdrop decorated with a kampong scene that was simply ideal for their show’s theme. That afternoon’s pouring monsoon rain did not deter me from joining proud parents and family members in the audience to enjoy A Tapestry of Malaysian Stories, Malaysian folk tales that were adapted for children. The programme of seven short dramas was presented with a 15-minute intermission after the fourth drama before they continued with the performance of the fifth drama. In her brief introduction, Elizabeth explained that this showcase of Malaysian stories aimed to bring together multi-ethnic children as they take on various roles. From the first drama on the wily Pak Belalang and his powers of prediction, I could hear the students’ voices and enunciation clearly through their individual microphones and was impressed by how well they could emote the various expressions! I’m a stickler for proper pronunciation and while the dialogue was bi-lingual in English and Malay, I was pleased to hear how the students were making good use of their lessons and speaking quite clearly throughout their performance. In spite of his small stature, Vishal Nair who played the title role, gave a charming performance as the crafty husband and father. I’m used to watching professionals perform on stage and as I enjoy the youngsters coming on and off stage in their well-rehearsed roles, I must commend them for their effort and commitment to not only learn their lines but also to understand their roles. Si Tanggang, the next drama, was about a young boy who vows to get out of poverty. He leaves the village to seek his fortune in the city and he not only worked hard to become wealthy but he also married the employer’s daughter. The narrator, Nathan Wesley Goh Tsu Kien, did an excellent job with his lively narration that linked the various scenes in this drama. And in that scene when Si Tanggang “disowned” his father (Shawn Lim Qi Sian) and his mother (Jin Yu Tong), I felt a sad twist in my gut as the moral of the story became obvious. I guess it must have been difficult for Dinesh Murugian, who played the title role, to portray himself as an ungrateful son and act with disrespect to his parents! Elizabeth, who was born in Kota Tinggi, said Teluk Sengat holds special memories and she picked the next drama to share a humorous take on how Teluk Sengat got its name. As the story unfolded, I followed the journey that Buyong and his wife took to this place which was eventually named in honour of Buyong who died of a mysterious ailment that was too critical to be cured, even after consulting various medicine men. I happen to know Shaun Wong Zhi Ren, who played the role of Buyong, and must admit that I recognized him more from his mannerisms than from his voice. This was because the Shaun I know was quite shy and I was pleasantly surprised to see how his speaking skills have been developed and displayed in his portrayal of Buyong! Mulling over this, I thought that Shaun was a classic example of how Stagecraft is helping students to develop themselves through a series of lessons and putting their acquired skills into action through a theatre production. Later when I spoke to his mother, she told me that Shaun had kept his role a secret from the family. And when she saw how well he performed on stage, she was impressed too! We cannot help but agree that speech and drama is certainly a powerful tool for personal development. The performance of Stagecraft’s showcase of Malaysian Stories continued with folk tales, Puteri Santubong & Puteri Sejinjang (a tale from East Malaysia), Batu Belah Batu Bertangkup (The Devouring Rock), The Sick Tiger and an excerpt from the Johor classic, Puteri Gunung Ledang. Students as young as age seven were encouraged to participate in the performance because Elizabeth believed that stage experience was not only empowering and inclusive but also an opportunity to light the students’ passion for the performing arts. Watching A Tapestry of Malaysian Stories was both enjoyable and encouraging as I saw how students’ speaking skills were being honed and nurtured. Who knows? This experience may be the first step that inspires someone to make the stage their career! Do you know that a pack of dinosaurs has stomped its way into Singapore Zoo and River Safari? Come face-to-face with Tyrannosaurus Rex, Spinosaurus, Stegosaurus, Triceratops and a host of their prehistoric cousins this year-end for a fun-filled, immersive discovery adventure and observe interesting parallels with the parks’ living collections and learn valuable lessons about saving today’s species from extinction. In a unique display that does not involve living animals, Singapore Zoo and River Safari present a lifelike animatronics collection of pre-historic creatures at Zoo-rassic Park during weekends between Nov 26 and Dec 18. Don't miss that Velociraptor lurking in the bushes! Dinosaurs disappeared from the face of the earth in the fifth extinction and now animal species are being wiped out at an unprecedented rate. In the last 50 years, we have lost 67 per cent of the world’s biodiversity. Through the Zoo-rassic Park experience, Singapore Zoo aims to raise awareness on this issue and rally visitors to do something to save the world’s biodiversity before it’s too late. Journey through the Same Same But Different Trail to learn about convergent evolution and be amazed by how the animals of today like giraffes, rhinos and bats, share similar features and behaviours with these relics of the past. Look out for the Compsognathus! You can also try your hand at being a paleontologist by excavating dinosaur fossils! Escorted by the dinosaur keeper into the realm of past giants, you cannot miss the opportunity to capture photo mementoes with the towering T-Rex and Velociraptor friends. On a misty walk in an exciting outdoor environment, look out for dinosaurs peeping at you through the foliage and unlock an interactive experience to learn fun facts about their relationship to other animals in the zoo through a Visual Discovery app, Blippar. Some Zoo-rassic Park residents have made their way to the freshwater attraction to meet their old friends in River Safari. Continue your prehistoric learning journey in Singapore Zoo’s sister park, River Safari, to learn about living fossils in the Extinction Escapees Trail. Here you will discover ancient animals like the Alligator Snapping Turtle, Indian Gharial and Giant Chinese Salamander that still exists now! While dinosaur-themed activities happen during weekends between Nov 26 and Dec 18, you can still catch the dinosaurs grazing in their new home at Singapore Zoo and River Safari until May 2017. Then hop over to Jurong Bird Park to meet the park’s animal icon, Sunny the hornbill, who’s also the ambassador for all threatened bird species that need our help and protection. 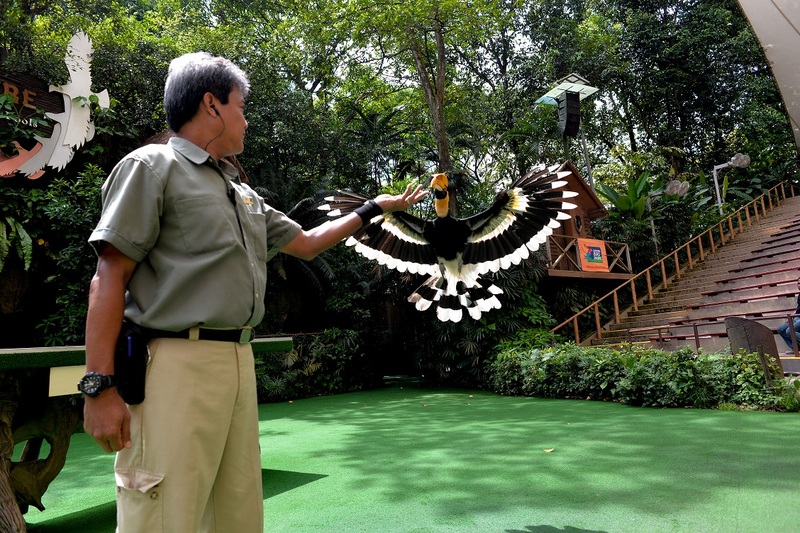 Jurong Bird Park, which started with just five hornbill species when the park opened in 1971, is now home to the largest collection of Southeast Asian hornbills in the world. Of the 18 hornbill species in the park, 11 are native to Southeast Asia. 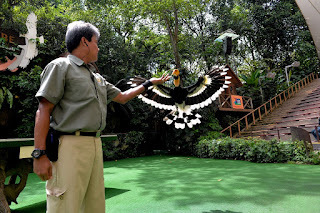 Visitors can participate in many hornbill-focused activities between now and Dec 11 including meeting Sunny the hornbill, feeding hornbills, doing craft activities, writing love notes for the Hornbill Love Mail and learning about them in the daily Hornbill Chit-Chat sessions. 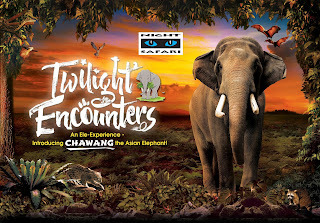 Enjoy Twilight Encounters with Chawang and his family! In the evening, head to the Night Safari to enjoy festive cheer with the Paw-some Parade where quirky costumed animal characters will parade down the entrance to jump start your night of animal encounters over Fridays and Saturdays between now and Dec 10. 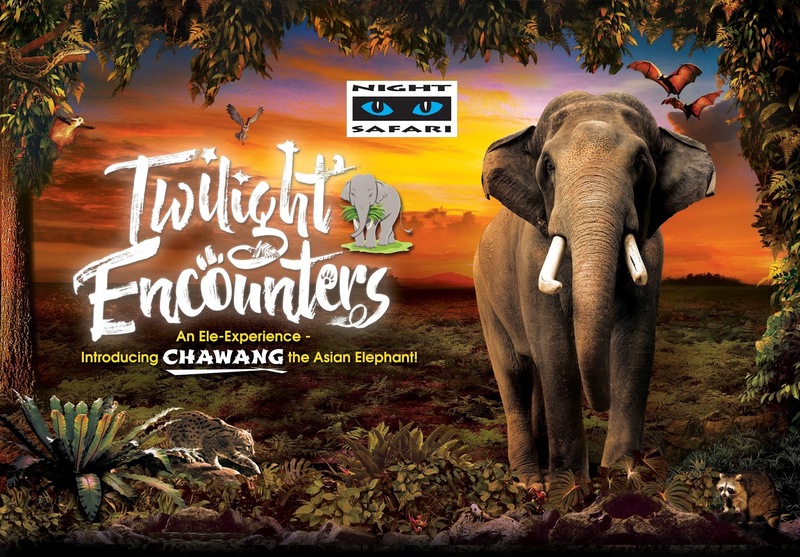 This year-end, Night Safari presents Twilight Encounters in activities themed around Chawang, the park’s famous elephant. Take a ride on the tram to meet the elephant family and be awed by the sheer size and power of the majestic Chawang with the latest addition to the family, baby Neha. Get ready for some Jumbo-sized Fun when you meet the Chawang mascot and be enthralled by the grace and finesse of fluorescent light show performers in Illumi-night as they dance and twirl with their lighted props against the dark backdrop of night. 1. 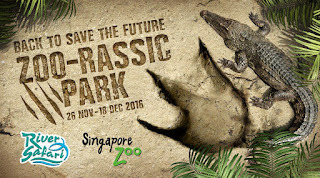 Zoorasic-Park takes place at Singapore Zoo and River Safari on weekends between November 26 and December 18. 2. Sunny the hornbill is Jurong Bird Park's new animal icon. Don't miss this opportunity to come face-to-face with T-Rex! The contest to win ten  pairs of ParkHopper tickets, closes on Dec 1 so send your answers to email: corpcomms.szg@wrs.com.sg with your full name, IC number, email address and telephone number. Winners will be notified by email. As the development of Vantage Bay at Jalan Ibrahim Sultan is gradually taking shape in Johor Baru, I’m pleasantly surprised to discover The Vibe at Vantage Bay. I often drive along this coastal route and for some time, I only saw a walled-in development site. But I recently had the privilege of a peek inside The Vibe, one of city’s newest integrated dining and entertainment destinations. A smooth drive along the Inner Ring Road takes me to the T-junction with a view of the Johor Straits ahead. While waiting for the traffic lights to change, I spot the striped towers of Senoko Power Station in Sembawang, on the opposite shore in Singapore. I turn left, heading to Vantage Bay where Brunch 2 Wine is located within The Vibe, for a lunch experience. Brunch 2 Wine first opened in Taman Molek and is hosting this event to introduce its relocation and presence in the city now. I drive slowly as I approach the entrance to Vantage Bay and follow the signs to the carpark behind the building. When I step into the new building, I take a moment to admire the landscaped gardens and water features that creates a cool and welcoming ambience, and also to get my bearings. I realise that it’s an integrated destination where the fine dining restaurant, Brunch 2 Wine, is situated adjacent to Bottle & Glass, the seafood bar. An alfresco area with a lawn is designed between these two outlets, dotted with high tables and bar-stools and a small stage is set up at one end of the lawn for live entertainment shows. Resisting the temptation to explore further, I quickly head towards the double glass doors that mark the entrance to Brunch 2 Wine. “Later,” I tell myself as I make a mental note to take a tour of the property after the meal. The doors open to a wide and well-appointed dining hall and I’m ushered to my seat at a long banquet table. I wave “Hello” to familiar media friends who are already seated there. The piped-in jazzy saxophone music is doing its job in soothing frazzled nerves and I must declare that the wrap-around feel of my chair, upholstered in a luxurious brocade fabric, is oh so comfortable! While waiting for more arrivals, I review our lunch menu printed on a sheet of paper, in anticipation what we will be eating for a starter, main course and dessert. Curious about the food here, I ask the waiter for the restaurant’s menu for a peek at the items they serve ala carte. The shiny cutlery, starched table linen, glittering chandeliers and vintage looking lampshades in the wall sconces, all work together to spell fine dining in an elegant ambience. The floor to ceiling glass walls are welcoming in natural light by day so when the sun goes down, I’m sure the mood with the muted lights against a backdrop of dark skies (in air-conditioned comfort!) will be absolutely mesmerising. When the waiter hands me the restaurant menu, it feels heavy in my hands. As I turn crisp dark pages with cream coloured cards (printed menus) mounted in slots at four cut-out corners, I’m instantly reminded of classic, old-fashioned photo albums. The only things missing are the black-and-white photographs and the opaque sheets that separate each page! I see the first lunch course being served at the other end of the table and I’m more than ready to sample the culinary creations of Chef Kelvin Lee, who comes with the prestigious reputation of culinary experience from three different, Michelin Star restaurants in France. Chef Kelvin, a Malaysian from Kuala Lumpur, brings his vast experience with Le Jardin Des Sens in Montpellier and Michel Bra in Laguiole as well as San Marco at the Lighthouse, Fullerton Hotel, Singapore, to create a range of exciting menus at Brunch 2 Wine. If the plating and presentation are anything to go by, the starter serving of Carpaccio of Totoro Brown Tuna drizzled with olive salsa and aromatic vegetables, is quite an impressive start. The artistic sprinkle of Japanese fish roe among the colourful cubed vegetables, not only creates quite a pretty bouquet but also presents contrasting flavours that pairs perfectly with the carpaccio! Between the two main courses of slow-cooked John Dory (fish) in olive oil, served with pesto and garden vegetables and Canard de Bresse (duck) served with baby carrots and flavoured with passion fruit juice, my obvious choice is the duck. Once again, I can’t help noticing how the main course is being presented on an interesting Japanese inspired flatware designed with an uneven surface. The slices of duck breast are presented in medium-rare doneness, each with a sliver of skin for a delicious burst of fat against the tender lean meat. Drizzled in passion fruit juice, its tangy taste coolly complements every bite of the breast meat. My only concern is the uneven surface of the platter. As I gently slice through the baby carrots, I’m fearful that a segment may zing off my plate and land on another diner! Thankfully, it’s just my overactive imagination and nothing untoward happened with the baby carrots… except that I happily ate them. Finally it’s time for dessert. I’m glad I still have some space left to enjoy the Chocolate Tart topped with a spun sugar sculpture, served on a bed of cookie crumbs and garnished by berries. The pastry crust cracks to a gentle touch as I cut through the tart and slowly savour each spoonful of warm Belgian chocolate, in an attempt to make it last longer! As the meal winds down to an end, Chef Kelvin joins us for a chat. He briefly outlines how he’s introducing traditional food with modern cooking methods where various techniques are applied and meals are presented with a combination of tastes using natural flavours from fruits and vegetables. While some items are prepared in recipes that include a dash of alcohol to bring out the flavours, Chef Kelvin assures diners that the serving staff are trained to advise which items in the menu are alcohol-free. As he speaks passionately about his food, I can see how he’s clearly having fun creating meals using a mix of Japanese ingredients in modern European cuisine and serving it with a touch of artistic elegance. As more diners are discovering the culinary creations here, Brunch 2 Wine also offers daily set lunch meals priced between RM45++ (3-course) to RM60++ (4-course) per set. It’s reassuring to learn that all ingredients are halal-sourced and no pork products are used in the outlets in The Vibe at Vantage Bay. Speaking of the other outlets, I’m ready to stretch my legs and explore further for a look at what else is happening here. I leave Brunch 2 Wine and step across the lawn into Bottle & Glass and discover its vintage décor complete with a long bar. It’s a seafood bar with indoor and outdoor seating areas as well as karaoke rooms for guests who wish to belt out a few songs! Across the foyer from Bottle & Glass, I enter another wing which houses Wheat & Wit, a pastry shop and bakery as well as a café for light meals like sandwiches, salads, pasta and all-day breakfasts. A glance at the breads and pastries reveals a range of buns and rolls including their signature croissants filled with molten salted egg and the other, filled with matcha or green tea. As I make my way to the carpark, I pass the TMC Care Pharmacy and through its glass doors, I spy the pharmacist serving customers. My attention is suddenly riveted to the tinkling sound from two tall water features. And when I approach the cast iron sculptures, I realise that they mark the wide entrance to the common restroom in the building. I find it rather amusing as I instantly recall the toilet etiquette in Japan where natural sounds are politely disguised by electronic sounds of trickling water! A great deal is indeed going on at The Vibe and it looks like the only thing left is for more people to discover the interesting vibes here. As I’m driving out, I can’t help smiling and feeling a deep desire to return for another exciting taste of the dining and entertainment options happening at The Vibe. The Vibe @ Vantage Bay is at Lot 6376 & 9236, Jalan Ibrahim Sultan, 80300 Johor Baru. Tel: +607 – 207 1600 (Brunch 2 Wine), +607 – 207 0771 (Bottle & Glass). It may be hard to imagine now but there was a time when the only affordable public entertainment in Johor Baru was going to the movies because only the affluent could afford to own a television. Movies are a popular entertainment choice because it’s an avenue to unwind and escape into another realm, to get involved with the plot and lives of screen characters, even for a while. Enveloped in dim darkness, it’s perfectly all right to cheer for the underdogs, scream aloud at shocking scenes or shed tears at tender moments. But there’s simply something magical about watching movies on the big screen. Many will fondly remember their first date of going to a movie after a meal because couples, getting to know each other, could enjoy being with their date for several hours without trying to impress or make intelligent conversation! The movie halls of today are small compared to former movie theatres that were stand-alone landmarks built with adjacent parking lots. Theatre locations were within convenient walking distances and as few people owned cars then, there was sufficient parking space. JB’s first cinema was the Sino-English theatre at the corner of Jalan Trus and Jalan Dhoby, opposite Hua Mui Restaurant. A few concrete steps is the only evidence left of this theatre today. The Capitol at Jalan Station was a premier theatre popular for screening Chinese movies. During an era when operas were made into movies, this attracted hordes of fans who enjoyed watching their favourite stars perform opera on the big screen. Besides Chinese movies, Capitol used to screen coloured, talking movies, mostly American Western or cowboy movies and blockbusters like The Greatest Show on Earth. The Capitol boasted of a stage which often hosted live shows by visiting opera stars from Hong Kong to promote opera movies by performing an excerpt of the film in a live show. In addition to large billboards displayed outside the theatre, publicity for coming movies and stage shows were also done by distributing printed flyers. Publicity flyers, commonly cut in landscape format with one-colour printing, were distributed by a vendor who walked around to shops, businesses and homes in town. My siblings, cousins and I, who stayed with our grandparents at No. 154 Jalan Ngee Heng during our school-going years, used to be fascinated by these flyers received in the letterbox. They were printed mainly in Chinese with brief English or Malay translations but we understood enough from the interesting pictures. Our grandparents, who were opera fans, made it a point to attend the live shows whenever Hong Kong stars came to perform. These thung thoi shows were very popular and the theatre offered free-seating on a first-come-first-served basis. But if our grandparents were to walk from Jalan Ngee Heng to Jalan Station, their favourite seats might have already been taken. 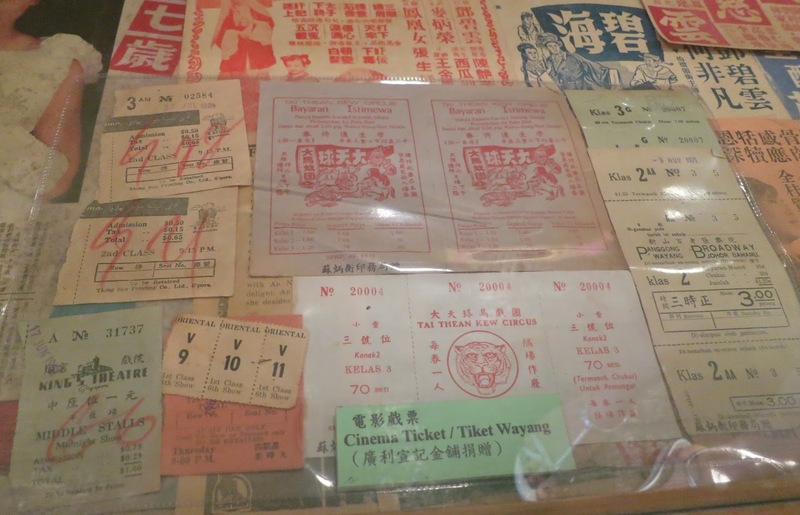 So grandfather or Ah Kong, used to have an arrangement with his friend, the theatre manager, James Ho, to reserve their seats by tying a handkerchief to indicate that two seats were booked! At that time, tickets cost RM2 for upstairs seats while the best seats downstairs were only RM1.25 and prices ranged between RM 1 and 65 sen for seats closest to the screen. Even though Capitol did not have air-conditioning, it was popular until it was demolished in 1972. Later, a cinema hall by the same name was reopened within the Merlin Tower building. At the same time, two of the most important landmarks along Jalan Wong Ah Fook were the Rex and Lido theatres. Rex, the older of the two, was ventilated only by ceiling fans. Audiences flocked to the adjacent Lido when it opened as a modern air-conditioned theatre and this probably forced the owners of Rex to upgrade and install air-conditioning! On Saturday morning, if we finished our chores early, Ah Kong would take his grand-children for a morning show at Rex or Lido. The cheap seats for matinee and morning shows was just 80 sen and if the show was popular, we would end up with tickets for the dreaded first row seats! These were the most uncomfortable seats in the house because we had to sink deep into the seats to angle our heads almost horizontal to watch the screen. Thankfully, this did not happen often because we always tried to walk to the theatre on time to get good seats! Perched on a hillock on Jalan Bukit Meldrum was the Cathay and we were sorry to see it demolished to make way for the Customs, Immigration and Quarantine complex. A nearby row of shops that served food conveniently provided meals before or after shows. Here, a popular laksa noodle adopted its name from the theatre and is known as Cathay laksa to this day! While all the other theatres were demolished in the 1990s, Broadway at Jalan Segget, popular for screening Tamil movies, is still in business. In those days, tickets were bound in booklets and various priced tickets were usually identified by different colours. The lady at the ticket counter was a familiar neighbour and she would mark our tickets with a thick red pencil before tearing it off from the counterfoil. In the lobby was a snack stall and Ah Kong would let us choose our favourite treats and we would select Mentos mints or Roundtree fruit gums while he picked Hacks cough-drops. It also sold a range of soft drinks, crisps, chewing gum and cut fruits on sticks but we were not to choose these. A kacang puteh man and his parked bicycle would offer a choice of toasted nuts and sometimes we bought our pick of nuts wrapped in paper cones made from paper recycled from old telephone directories! If popcorn is the staple snack for modern movie-goers then it must have replaced kuaci or melon seeds. Our movie watching experience was always punctuated by click-clicking sounds and at the end of the show, we would walk gingerly out of the theatre, crunching piles of kuaci shells underfoot! Tony Roma's now opened in Tebrau City!